SJP marketing partners, Allied Building Contractors in Essex, bring a new approach to building services and project management. 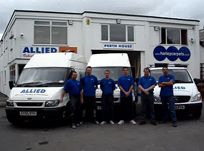 Allied Build represent specialist tradesmen – plumbers, builders and electricians – who ply their unique skills wherever they are needed. Allied Building Contractors are also a project management company who can bring these skills together, as they are needed, for house extensions, conversions, refurbishments and new build housing. Working closely with local architects, planners and designers, Allied Build offer a concept to completion service for their customers. Allied Building Contractors extensive experience and local Essex knowledge make them an ideal choice for homeowners, landlords and property developers in Chelmsford, Brentwood, Basildon and beyond. Allied Building Contractors work in the domestic, commercial and industrial sectors. Recent projects have included building new workshops in Ingatestone, the complete electrical refurbishment of a hotel in Chelmsford, refurbishing and partitioning factory space for change of use, and building projects in schools, sports centres and nightclubs in Essex, Kent and London. Allied Build electricians are NICEIC approved and associate members of the Electrical Contractor’s Association. Our plumbers are fully qualified craftsmen, experienced in fitting new kitchens, bathrooms, shower and wet rooms. From external pipework and drainage to the installation of central heating systems and boilers, Allied Build cover all plumbing needs. For homeowners needing more space to business managers needing a whole new factory or workshop, Allied Building Contractors are the Essex builders for construction, refurbishment and development. Examples of recent projects can be found in the Allied Build article on our website or for further information visit them at www.alliedbuild.co.uk.